3) For pricing/availability of other models/calibers, please email/call. NOTE: If you’re in a magazine ban state, we will ensure that your order receives low-capacity magazines as necessary. However, we are in the great state of Florida, and don’t monitor bans and restrictions in other states. We expect customers to know and comply with the laws that pertain to them in their state/locale. If you order an item that’s not legal in your state, your order may be cancelled with extreme prejudice, but will also have their refund subject to an admin fee of 100% of the order total. This is the grip package (L1MP), and there is only level of package with some options. Duty Series & Signature Series M&P and Shield Grip Packages Include (Read below for full description)…. Trigger guard/frame juncture high cut and polished to eliminate the awkward textured patch and edge line gap that is there from the factory; this delivers a higher, more comfortable grip and eliminates the abuse some shooters get on the knuckle of their middle finger. Bottom of trigger guard flat textured for support hand traction. Molding seam lines removed from the tang area (if applicable…some frames come from the factory with rough seams from the injection molding process, and we remove and polish those if necessary). Your choice of texture grade on the grip: Sharp, Medium, Fine, or Carry Combo (medium on the front and back, fine on the sides). Medium or Carry Combo is recommended for concealed carry applications. All textured areas framed in with our recessed edge lines for a clean border. Provides traction for secure support hand placement. Note: Trigger guard flat texturing is not included in the M&P/Shield grip package like it is with the GLOCK. This is because on GLOCKs, the forward part of the trigger guard flat is reprofiled as part of the ergonomic package, and must be either polished or textured to finish it. With the M&P, this area is not modified as part of the grip package, so if you'd like texturing (framed with recessed borders) along the flat, select this option. Another reference feature. This mod provides consistent and secure support hand placement. Our unique convex profile maximizes surface area contact, and the prominent ledges at the front and back prevent your support hand from slipping out of the groove. Specify if you want the groove area polished smooth or textured. Note: This option has either texture or polish included (select one)-do not select/combine the TGTX option with this. A reference feature. The flat surfaces on both sides of the frame directly in front of the takedown lever are where most shooters place their support hand thumb when using the common "thumbs-forward" grip; conversely, the flat on the opposite side is also where most shooters index their trigger finger for safety when their sights aren't on target. Ben has determined that by having these areas recessed and textured on both sides, the shooter benefits from two levels of tactile reference (the concave recess AND the texture itself) to ensure repeatable grip placement and safe trigger finger index. These reference points are particularly useful for ambidextrous training, as it provides a quick-reference under all conditions (day/night/gloved/etc) to ensure that your support-hand grip is consistent with your primary grip. Note: Another very important aspect of having the texture recessed down into the frame is that it also prevents additional drag and damage to the holster or texturing itself, which will occur whenever the texture stands proud from the frame surface. For trivia's sake, one of the characteristics of the heat-stippling process is how the polymer "blooms" out from the frame and increases dimensions in textured areas. With leather or suede-lined holsters, contact with a raised surface texture on the flats will scrape away material from the inside of the holster itself, making a mess and eventually ruining the lining; in Kydex holsters, the holster material is harder, and will actually burnish the frame texture smooth, which quickly negates its effectiveness and makes it look unsightly. With the recessed method Ben developed, there is no FIP contact with the holster. Half-moon cutouts on either side of the grip, to facilitate stripping a stuck magazine. This is primarily an "added insurance" mod, as M&P pistols generally aren't prone to malfunctions where a magazine has to be stripped by force. Apex Tactical Trigger Packages: We only stock, recommend, and install Apex Tactical trigger kits in M&Ps and Shields, as we have determined that they are by far the best aftermarket ignition system uprades for these pistols in the industry. As an Apex Tactical authorized dealer, we also install and tune them to the exact specs set forth by Apex Tactical, as described below. If you have an Apex Tactical kit already, you're welcome to send it with the gun for us to install. Install/tuning labor cost for customer-provided kits varies based on the kit itself. We will ONLY install trigger kits from Apex Tactical; do not send kits from any other company for installation. This package includes installing the Apex Duty Carry Action Enhancement Kit (DCAEK). The Apex Fully Machined Sear and trigger bar are polished to run as smoothly as possible as part of this service. An approximate 5-6 lb trigger pull weight can be expected, depending on factory tolerances. This package includes installing the Apex Forward Set Trigger kit (FS Fully Machined Sear, FS Ultimate Striker Block, Trigger Return Spring, and FS Trigger). The Apex FS Fully Machined Sear and trigger bar are polished to run as smoothly as possible as part of this service. An approximate 4-5 lb trigger pull weight can be expected, depending on factory tolerances. 1. M&P/ Shield Slide Package $595 : New front and rear straight Mako-style cocking serrations, Boresight Solutions logo recessed/engraved on the top front flat (in certain versions, such as Ported/compensated slides, the logo will be surface engraved as required), Mako top/rear serrations, and black nitride treatment. 2. M&P RMR Slide Package $595 : New Front and rear straight Mako-style cocking serrations, Boresight Solutions logo recessed/engraved (in certain versions, such as Ported/compensated slides, the logo will be surface engraved as required), milled footprint for Trijicon RMR placed to the REAR of the slide, with a new rear sight dovetail milled in FRONT of the RMR footprint, and black nitride treatment. Suppressor sights required for this package. DO NOT SELECT THIS PACKAGE FOR SHIELDS. 3. Boresight Logo : We understand that due to Department Policy or simply customer preference, some people wish to skip the logo engraving. Simply note this on the “special instructions” at checkout. Pricing does not change for deleting the engraving from the package. 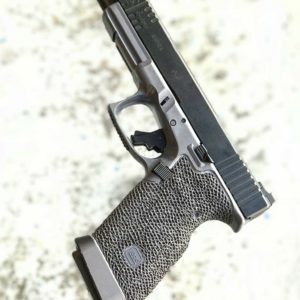 The Signature Series M&P and Shield grip package shares the exact same pattern layout and functional modifications as the Duty Series package, but Signature projects (all work done by Ben himself) receive a significant amount of extra aesthetic sculpting, polishing, and overall refinement. 360-degree Texture. 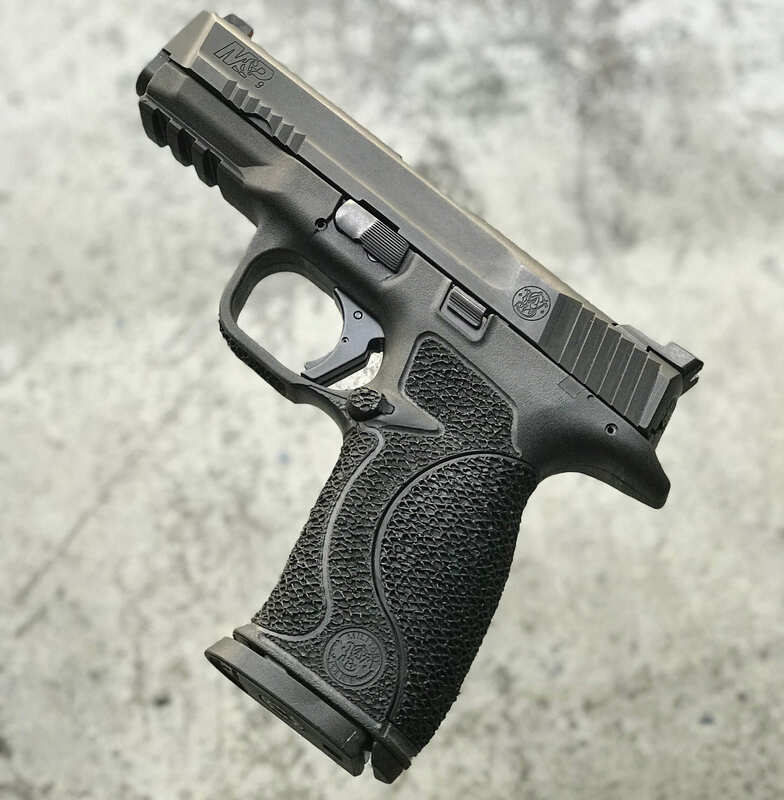 Frame textured is laid out on the grip in a shape that not only provides maximum contact for the shooter’s primary and support hands, but also complements the M&P and Shield pistols’ inherent “grain” and aesthetics. Because the M&P has a longer tang that provides very good leverage in the hand (unlike the abbreviated tang on a GLOCK that offers very little leverage), traction in the tang area of the M&P isn’t necessary, and can even be painful, hence why we don’t texture up under the tang. Like the tread lugs in a mud tire, our distinctive texture profile effectively channels away liquids (sweat, blood, water, oil, etc) to prevent them from forming a slippery barrier between your hand and the grip. Texture can be had in sharp, medium, or fine grades. We also offer a carry-friendly combo where the sides are less aggressive than the front and back, so as to not chafe your side or snag your concealment garment. Texture is easy to clean with warm soapy water an old toothbrush. Where other aftermarket texture jobs can dull and wear away with light use, our texture pattern was developed specifically to withstand daily hard use by active-duty professionals. We combine comfort and ergonomics with traction and speed by transitioning our texture in key areas so as to not create hot spots or performance-inhibiting friction between your hand and the grip when drawing/manipulating/hostering the pistol. Trigger Guard Undercut & Polish. The trigger guard/frame juncture is undercut and beveled convex on both sides to match the angle at wich your middle finger rests under the trigger guard for both right and left-handed grip. This essential modification eliminates the rough, sharp-cornered, textured patch that’s (inexplicably) there from the factory, and allows for a higher, more comfortable grip on the gun. Magazine Release Fence Removal, M&P only (optional). The raised fence around the magazine release is relieved flush with the frame and the rear “guide tab” of the mag release button is beveled and polished so as not leave a sharp corner to greet your thumb. 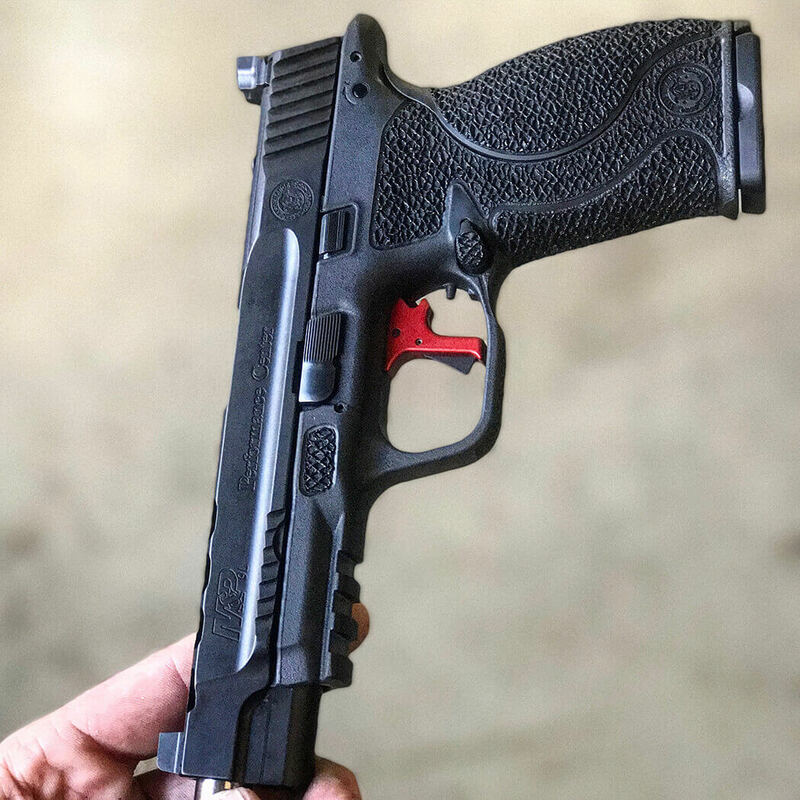 This mod is included in the grip package in lieu of offering a full magazine release scallop, as doing a scallop on M&P and Shield mag releases leaves them unsupported, and can result in the magazine being pinched in the gun and not dropping free, which is a major liability. By simply removing the fence, the shooter has more direct thumb access to the magazine release, and the functionality of the magazine release mechanism isn’t compromised like it is with a full scallop. Specify right or left side (a right handed shooter will normally have the magazine release button on the left side). If you’d prefer that I not remove the fence, don’t specify a side. This is not included in the package for Shields, as the Shield mag release button is steel and would require refinishing after being modified. Recessed Texture Edge Lines. By framing the textured areas of the grip with deeply recessed edge lines at the top and bottom, it not only adds an element of OEM aesthetic refinement to the overall package, but also serves a functional purpose. The step created by recessing the edges helps to prevent your hand from slipping down or riding up the grip under recoil. Some shooters experience stoppages because their support hand interferes with the slide stop under recoil, which results in the slide either locking back prematurely, or failing to lock back on an empty mag. As such, the deeper recessed edge we create beneath the slide stop area helps keep the support hand from riding up too far and engaging it accidentally. (note: all textured areas outside the grip itself, such as the trigger guard and frame flats, are also framed with matching recessed edge lines.